TRANSPLORERTM is a software package for recognition and visualization of transcription factor binding sites in DNA sequences. While TRANSPLORER is a pure JavaTM application it can be executed in many platforms. We have developed fastest algorithm for matrix based search letting to process quickly DNA sequences of any length including whole chromosome sequences. 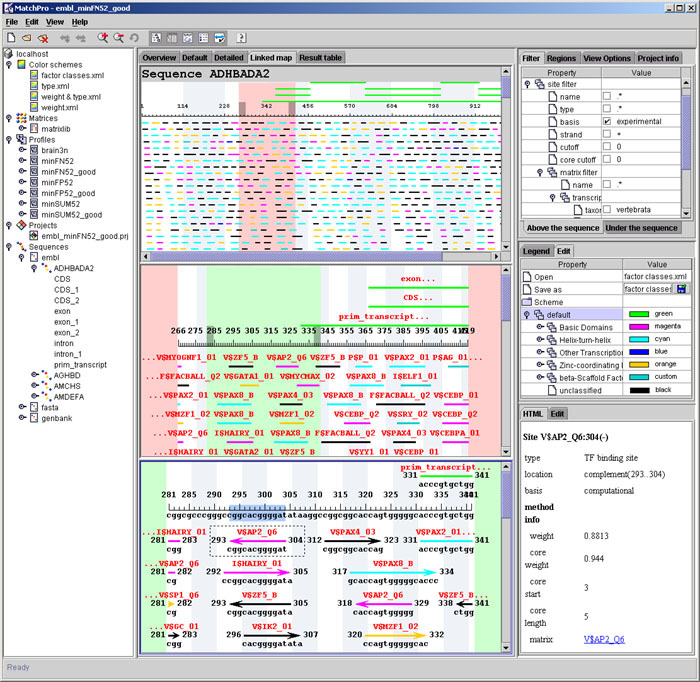 TRANSPLORER can process DNA sequences in the most popular formats including EMBL, GenBank and FASTA. TRANSPLORER uses the biggest library of matrices derived from TRANSFAC� Professional database and therefore provides a possibility to search for a great variety of different transcription factor binding sites. A search can be made using all matrixes or their subset from the library. Specific subset of weight matrices along with their cut off similarity values is called "profile". Powerful Profile Editor allows a user to select matrixes from TRANSFAC� Professional or user's own matrix libraries. Applying different filters user can select matrices for transcription factors with specified features: name, taxon, organism, DNA-binding domain and/or tissue specificity. Profile editor also allows a user to specify cut off similarity value for each matrix providing on fly estimation of false positive for the given cut off value. Search results along with search parameters are called project. Powerful Project Wizard guide a user trough the analysis steps. The search results are stored in the database. The results can be presented in tabular form where rows are sites and columns are site features. User can insert or delete binding sites as well as make comments or change site descriptions. The database also stores experimental structural and regulatory gene regions extract EMBL or GeneBank Feature Table. TRANSPLORER provides a most powerful graphic presentation of results in the form of gene sequence map. There are three map modes: overview mode allows user to visualize long sequences as a whole, default and detailed modes are used to provide thorough visualization of results. TRANSPLORER allows a user to use several modes simultaneously: in overview mode user can select the sequence region of interest and investigate this region more thoroughly in default and/or detailed mode. Powerful set of filters allows the researcher to visualize binding sites for transcription factors with the specified features: name, taxon, organism, DNA-binding domain and/or tissue specificity. Color schemes are distinctive feature of TRANSPLORER site visualization. Color schemes colorize site view depending its features: similarity with weight matrix, site type or peculiarities of transcription factor binding with the site. This improves greatly user comprehension of complicated sequence map with a lot of sites. TRANSPLORER is tightly integrated with TRANSFAC� Professional database via its Web interface. TRANSPLORER was developed by DevelopmentOnTheEdge.com for BIOBASE GmbH. For additional information, please contact BIOBASE at marketing@biobase-international.com.